ST. LOUIS, Missouri – Opened in 1995, the Edward Jones Dome in St. Louis is no stranger to bringing new attractions to town. 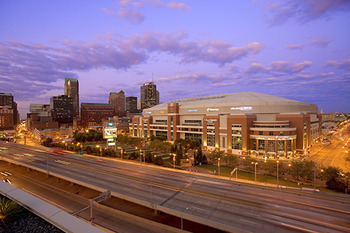 Owned by the St. Louis Regional Sports Authority and operated by the St. Louis Convention & Visitors Commission, the facility is part of the city’s convention center complex and seats up to 68,000 people. Its new HARMAN Professional audio system, featuring BSS Audio, Crown and JBL VERTEC® loudspeakers, is part of the continuous program to improve the experience of attendees at a variety of sporting events, as well as large conventions, religious gatherings, and much more. The Edward Jones Dome project is the largest installation of powered VERTECequipment in the world. At the heart of it are 12 arrays that each contain 12 JBL VERTEC VT4889A fullsize line array elements with DrivePack® DPDA input modules. In addition, there are two arrays of nine and two arrays of 12 JBL VERTEC VT4887A compact line array loudspeakers with DPDA modules that cover the field. All arrays utilize a top and bottom short frame and are suspended by a custom Polar Focus rigging system that allows every array to be operable for service. The installation also features four BSS Audio BLU-800 devices, two of which are used in the control room to create new networks. Of the remaining two, one feeds all bowl loudspeakers and the other all of the under deck and back of the house fill speakers. Rounding out the installation are 25 Crown amplifiers. The South Amp Room, which powers underdeck and back-of-house loudspeakers is equipped with 10 DriveCore™ Install (DCi) 4|1250N amplifiers. The North Amp Room, which powers underdeck and back-of-house loudspeakers as well as an overflow press area, has 11 DCi 4|1250N amplifiers. There are three DCi 2|300N amplifiers in the main control room which power various booth monitors and elevators, and one Crown DCi 4I1250N amplifier, also in the Main Control Room, which is available as an auxiliary amp for various speaker needs on and around the field. Throughout the project, TSI worked closely with consultants Ross & Baruzzini, Inc, as well as John Powell, vice president of sales for JBL, Doug Nelson, accounts manager with Network Sales and Marketing, and Aaron Kunz, HARMAN territory sales manager. Brad Ricks and George Georgallis from HARMAN assisted with system tuning and Emilian Wojtowycz, also of HARMAN, offered pre-tuning assistance. Polar Focus provided engineering input, creating a system that provided solutions for ease of service while simplifying the seismic restraint needs, all while increasing the seismic protection offered. Together, the team worked to address challenges unique to the Edward Jones Dome, including the shape of the dome, which made solid, even coverage for both lower and upper seats a potential problem. In order to expedite tuning of the massive PA the team utilized JBL HiQnet Performance Manager™ and the system is now remotely configured and managed on a day-to-day basis using HARMAN HiQnet Audio Architect™. “We were able to minimize our time from start to finish on this project using both HARMAN software platforms,” added Buckalew.